Matt and I went on a rare date last night to see Dark Knight. This is a fantastic thriller! 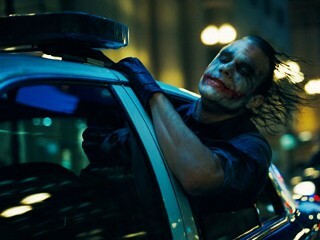 Our enjoyment of the movie was made bittersweet by the knowledge that we won't see Heath Ledger in another performance. He carried the film, and at each brilliant scene or line we found ourselves contemplating this sad point. Part of what made his performance so great is the camera work that was paired with Ledger's Joker scenes. Look closely - the filming is more loose, shakey, close, and just a bit crazed... this was a perfect method to convey his crazed and unpredictable character.